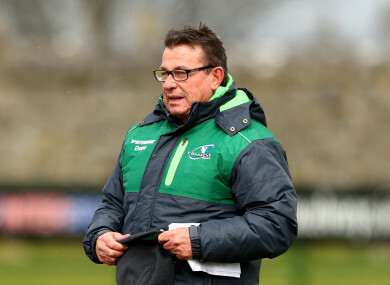 CONNACHT COACH KIERAN Keane has conceded that his side’s only route into the Champions Cup is by winning this season’s Challenge Cup, and he thinks they are very close to a major breakthrough under his leadership. European rugby has blown a breath of fresh air through Connacht’s season and their unbeaten pool campaign is in stark contrast to their six wins from 18 PRO14 games to date under Keane. On Saturday, Connacht host Gloucester in the Challenge Cup quarter-final, where a win will give them a place in a European semi-final for the fourth time, and despite still having a mathematical chance of succeeding via the PRO14, all Keane’s eggs are in this basket. “Without a doubt. There’s no grey there. But winning that is not a panacea for curing of all ills. I think the issues that we have faced right from the get go is being able to adapt to a new way of playing,” said Keane. “Different playing group, different coaching group. These things take time. But I’m happy with the way it’s going personally. Erratic form has bedeviled Connacht’s season and they currently sit second last in Conference A. With three games remaining they cannot reach the PRO14 play-offs, although the ban on South African clubs playing in Europe next season means they could yet sneak in via a play-off. There has been some memorable wins and performances along the way with victory Ulster and Munster the standouts, but contrasting home defeats to Zebre and Edinburgh of late have marred their league campaign – as well as one away win from nine attempts. Keane is positive though and has put their frailties down to teething problems in his first season as coach. “Inconsistent would be accurate no doubt about that. But I think the biggest thing for me is that we are growing and getting better. “We are getting a bit more settled and we’ve got a new broom in the place as you know with a new coaching structure and we are just getting better and were focusing on getting better each day. “We’ve had our highs and we’ve had some lows and those inconsistencies are growing pains perhaps. “(Europe) has been kind to us, it’s been good, it’s been interesting travelling too. We’ve had some challenges around it and the boys have really used that as a forum really to gather some momentum which is great. If Connacht are to take the win and reach the last four they will do it without centre Eoin Griffin (hamstring) and winger Cian Kelleher (ankle), who has been ruled out for the rest of the season. Their stocks have been boosted by the return of Kieran Marmion and Bundee Aki from Ireland duty, although Ultan Dillane might not start due to a lack of game time. Email “'There's no grey there' - It's Europe or bust for Kieran Keane's Connacht”. Feedback on “'There's no grey there' - It's Europe or bust for Kieran Keane's Connacht”.